Greg Norman, the 2017 Memorial Tournament Honoree, was recognized in a special ceremony Wednesday at the Memorial Tournament. World Golf Hall-of-Famer Greg Norman, a two-time winner of the Open Championship and runner-up in seven other major championships, is the Honoree for the 2017 Memorial Tournament presented by Nationwide. Norman, 62, is one of six multiple winners of the Memorial Tournament, winning in 1990 and 1995. Norman was recognized in the Memorial Tournament’s annual Honoree Ceremony Wednesday at Muirfield Village Golf Club. Also being honored posthumously were major championship winners Tony Lema and Ken Venturi, and amateur standout Harvie Ward. 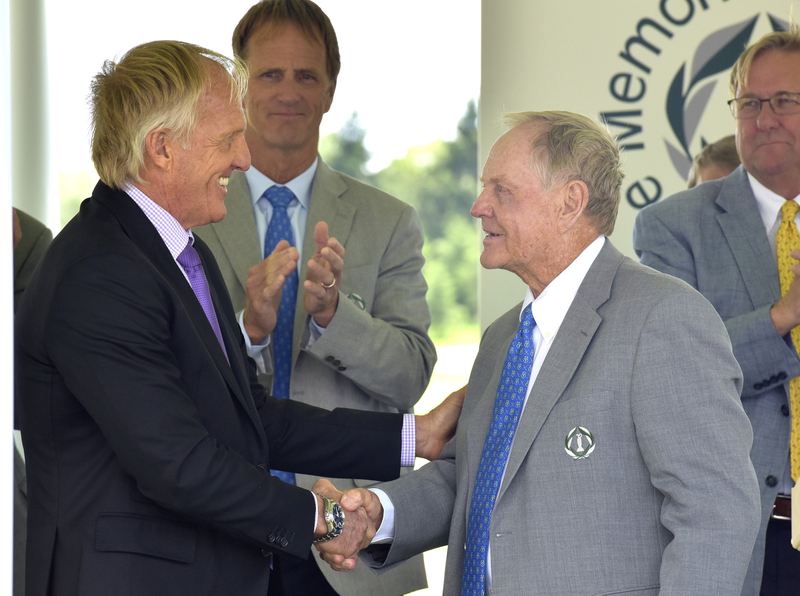 “I first met Greg in 1976 when we were paired together in the first two rounds of the Australian Open,” Jack Nicklaus said at Wednesday’s ceremony. “I had heard great things about this dashing, blonde 21-year-old Australian, and I was looking forward to witnessing it myself. Greg stepped on the first tee and proceeded to cold-top his drive en route to an 80. I promise you, folks, it got much better from that point on. Although taking up golf later than many of the game’s greats, Norman amassed 91 professional victories around the world and reigned atop the Official World Golf Rankings for an astounding 331 consecutive weeks. The dynamic and charismatic Aussie, with his shock of blonde hair, earned the nickname “The Great White Shark” for his aggressive, attacking style of play. He also had a bite to his wit, evident in the exchange Nicklaus and Norman had when they were neighbors in the same Lost Tree community in North Palm Beach, Fla. In just 18 months, Norman was playing to a scratch handicap, and after participating in a series of amateur events, he turned pro in 1976 at age 21. He earned $28 a week as an assistant professional at Royal Queensland Golf Club, a far cry from when he later became the first golfer to surpass $10 million in career earnings on the PGA TOUR. Norman began competing on the PGA TOUR full time in 1983 and won the Kemper Open and the Canadian Open the following year. He became one of the most dominant players in the world in the 1980s and early ’90s and was consistently at the top of the leaderboard in the major championships. In 1986, Norman assembled one of the great seasons in golf history. He won 10 times worldwide and led both the PGA TOUR and the Australasian Tour money lists. Most significantly, he held the 54-hole lead in each of the four major championships, and he broke through for his first major title that year by winning the Open Championship at Turnberry, in Scotland. Ironically, the victory came after Nicklaus—who beat Norman earlier in the year at the Masters—gave his friend a swing tip on the eve of the final round. Norman captured a second Claret Jug in 1993 at Royal St. George’s, thanks to a sterling final-round 64. It was during this dominant run that Norman conquered Muirfield Village Golf Club—twice—to quench his desire to win on a course designed by Jack. “When you think about the winners of this tournament, and you think about the strength of this field, it’s equal to any major championship and equal to any tough golf course we play,” Norman said. Off the course, Norman embarked on a successful business career, establishing his Greg Norman Golf Course Design company in 1987. He expanded into other business avenues even as he maintained his full-time touring schedule. He founded the Greg Norman Collection clothing line in 1992 and made his foray into the wine industry with the formation of his umbrella multinational corporation, now called the Greg Norman Company. His philanthropic efforts have raised more than $12 million for charities, including CureSearch for Children’s Cancer, which is supported by a tournament he hosts, the Franklin Templeton Shootout, and the Environmental Institute for Golf, promoting sustainability and environmental responsibility. A native of Tarboro, N.C., Edward Harvie Ward was best known for his dominance as an amateur golfer and won both the U.S. Amateur and British Amateur before becoming a top teacher. He first came on the scene in 1949 by winning the NCAA Division I individual title while attending the University of North Carolina, where he earned a degree in economics. Three years later, Ward captured the British Amateur, and he finished runner-up in 1953 in his title defense. Known for a razor-sharp short game, Ward would add the 1954 Canadian Amateur to his resume and then U.S. Amateur titles in 1955 and ’56. He is one of two men to win British, U.S. and Canadian Amateur trophies. Ward went a perfect 6-0 in three Walker Cup appearances, in 1953, ’55 and ’59, the latter as a teammate of a young Jack Nicklaus. He competed in 18 majors – 10 Masters and eight U.S. Opens – and finished fourth in the 1957 Masters after beginning the final round just one stroke behind Sam Snead. In 1974, Ward turned professional and became a world-renowned golf instructor. His most famous pupil was three-time major winner Payne Stewart. Ward died in 2004 at age 78. The Memorial Tournament presented by Nationwide is held annually at Muirfield Village Golf Club in Dublin, Ohio, a suburb of Columbus. The Tournament, founded and hosted by Jack Nicklaus, is conducted each year with three goals in mind: to honor the memory of individuals living and deceased who have distinguished themselves in the game of golf; to showcase the world’s best golfers competing on one of the most challenging venues in the world for the enjoyment of spectators; and to benefit many Greater Columbus Charities in alliance with the Nicklaus Children’s Health Care Foundation, Nationwide Children’s Hospital and numerous other local organizations. For more information, visit thememorialtournament.com or call 614.889.6700.